The Israeli state-funded dance company Batsheva has been invited to perform at this year’s Edinburgh International Festival. In response to this invitation, the ‘Don’t Dance with Israeli Apartheid’ campaign has written to Jonathan Mills, the Director of the Edinburgh Festival, protesting about the invitation to Batsheva Dance Company. The letter, reproduced below and endorsed by Tayside for Justice in Palestine, draws his attention to the use of culture by the Israeli government to spin Israel’s image and obscure the brutal reality of the occupation of Palestine. Batsheva Dance Company is scheduled to appear for three nights at the Playhouse on Leith Walk during the Edinburgh International Festival – from 30/08 – 01/09. They then have an 8-city UK tour later in the year, including the two opening slots in Edinburgh’s Festival Theatre, Nicholson Street. Protests are currently being organised. 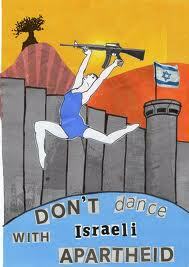 The ‘Don’t Dance with Israeli Apartheid’ campaign protests in the strongest terms about the invitation to Batsheva Dance Company to perform at the Edinburgh International Festival 2012. You should be aware that the Palestinian Campaign for the Academic and Cultural Boycott of Israel (PACBI), have called since 2004, for a boycott of all cultural performers and exhibiters that are institutionally linked to the Israeli state. PACBI is part of a broader Boycott, Divestment and Sanctions (BDS) campaign that was called in 2005 by nearly 200 Palestinian civil society organisations. These campaigns allow individuals, organisations and indeed festival directors across the world to make a difference and help bring an end to the regime of occupation, colonisation and apartheid that has been imposed by Israel upon the Palestinian people for 64 years. We all have a duty to act because our governments fail in their obligation to act. There should be no normalisation, no ‘business as usual’ with states that practice apartheid. The tactic of boycott was legitimate and effective in helping to end apartheid in South Africa and it can make a significant contribution in countering the latest manifestation in Israel/Palestine. Without question, Batsheva meets the criteria set by PACBI for boycott action and it is for this reason that we are calling on you to withdraw its invitation to perform at this year’s festival. Batsheva was targeted for protest throughout its North American tour earlier this year because of its complicity with the Israeli state and the Brand Israel deception. If their appearances at this year’s Edinburgh International Festival and on tour in the UK in October and November 2012 go ahead, it will be imperative that these occasions are also used for similar protests. We would always reject any suggestion that culture inhabits a world disconnected from politics. The efforts of ‘Brand Israel’ give incontrovertible evidence of how these matters are inseparable. In any society cultural activities can be provided on a discriminatory basis, promoted and funded for some groups but denied to others. Hana Awaad, a long-time member of El Funoun, one of Palestine’s premier dance troupes has stated, ‘Whilst Israeli artists and performers have freedom to tour, exhibits and performances by Palestinian artists are systematically banned, sabotaged and closed down by the Israeli occupation. Artists themselves are targets of violence, arbitrary arrests and deportations. Israel’s 3 tiered system of occupation, colonisation and apartheid ruthlessly suffocates the livelihoods of Palestinian communities, including the right to artistic and cultural expression.’ The restrictions faced by Palestinian performers however only mirror the experience endured by all Palestinians. Every aspect of life is affected by Apartheid Israel’s mechanism of control which involves hundreds of checkpoints, permit systems, curfews, closures of roads and villages, the apartheid wall, imprisonment and military force. The Edinburgh International Festival is one of the most prestigious arts festivals in the world, and we believe that it should be, unambiguously, on the side of justice and human rights for all. This means opposing Apartheid Israel and those who act as ambassadors for this state. We call on you to withdraw the invitation to Batsheva Dance Company. This entry was posted in Action, BDS, Boycott Israel, Campaign, Edinburgh, Uncategorized and tagged Boycott, Edinburgh, Occupation. Bookmark the permalink.